After my Tiger Woods prediction last Sunday I was not made to look like a fool in the Pebble Beach Pro-Am. It will be interesting to see whether Tiger takes out “at least” one Major this year like I predict. If he does or doesn’t it wouldn’t surprize me either way. But I was interested to get quite a bit of feedback that people are sick of hearing about Tiger Woods. And as it so happens, as I was searching the Internet I came across something from Forbes magazine to say that in a survey Tiger Woods was one of the most disliked athletes in the world in 2011. However, the T.V. ratings for the Pebble Beach Pro-Am were the highest in 15 years. Just goes to show…as much as people might not like Tiger Woods personally, they will tune in to watch him. 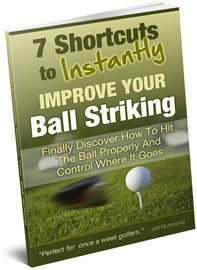 Pro’s Swing Slowly So You Need To Slow Your Swing Down- WHATEVER! One simple way to learn to swing faster is to simply turn your driver upside down so you grip it near the clubhead. Then swing it. If you get a swing speed radar like this one I recommend and you find that you’re not swinging at least 10% faster than your normal driver swing speed, then you’ve trained yourself to swing slow. When I have a long shot and the ball is on a lie below my feet I have a hard time hitting these shots very well. Can you give me some pointers to improve my success rate on this shot? When you are faced with a shot where the ball is lying below your feet you must always take a longer club than normal and the more severe the slop the more club you should take. So let’s say you’re 150 yards to the flag and your ball is on a lie below your feet. If you would normally hit a 7 iron then you should play a 6-iron if the slop is moderate. If it’s a steep slope then you could play a 5-iron or even a hybrid. You’re not doing this because you’re going to lose tons of distance, but instead you’re doing it because the longer the club the easier it is to reach the ball for this type of lie. Now, when you address the ball you want to bend more from your waist so you are closer to the ball. But make sure you keep your weight centered on your feet and not towards your toes otherwise you’ll fall forward when you swing and that will be bad. When setting up to the ball you also need to aim left of your target as this type of lie automatically produces a left to right shot, so if you slice the ball you’ll have to allow for a lot more left to right spin. When swinging on a sidehill lie like this you must concentrate on keeping your posture the same throughout the swing. If you raise your head up at all then you will be inviting disaster. Take a longer club than normal. Aim left of the target to allow for the natural left to right spin that this slope adds to your shots. 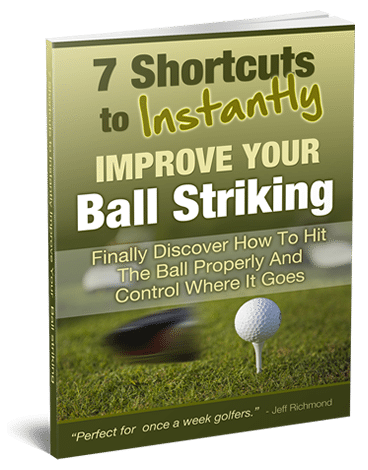 Bend over more at the waist so you’re closer to the ball and keep your weight centered on the balls of your feet. Keep your posture the same throughout your swing. This is IMPORTANT!